Makeup artist David Horne has been working in the industry for over 20 years with a long list of accomplishments behind him. As well as working alongside Alex Box, Sharon Dowsett and Val Garland he has taught at many prestigious colleges and is currently director at the Illamasqua school of Makeup art. 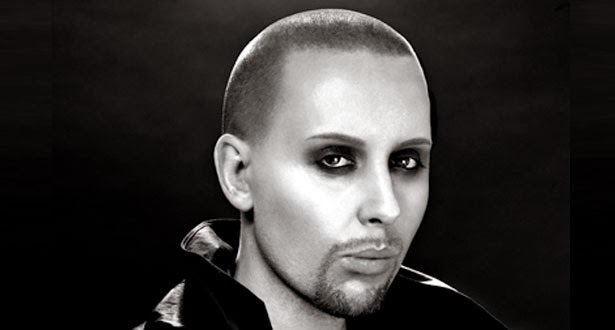 After searching for books referencing male makeup without success David decided there was a gap in the market so created a book which showcased male makeup that wasn't just a female impersonation. The 66 page book hosts various masculine makeup looks alongside the face chart design and colour swatches of the tones represented in the looks. The makeup was keyed by makeup artist Mark Bowles along with a team of other artists and hair stylists. There are some great tips on how to achieve a masculine styled makeup look by the colour choice, using more aggressive brush strokes and enhancing contours. Definitely keen to add this one to my collection it looks amazing! So cool.. looks so arty!